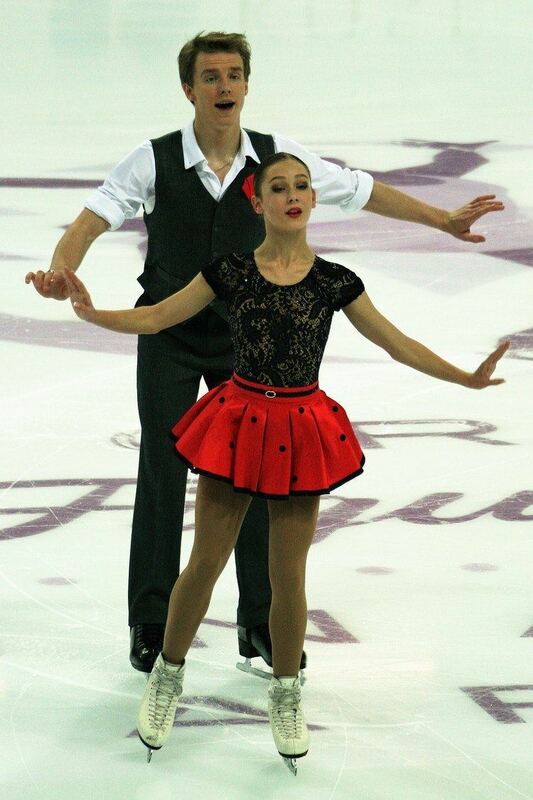 Amina Gennadyevna Atakhanova (Russian: Амина Геннадьевна Атаханова, born 3 May 2002) is a Russian pair skater. With partner Ilia Spiridonov, she is the 2015–16 JGP Final bronze medalist. Atakhanova started skating in 2005. She and Ilia Spiridonov began competing together in December 2014, coached by Natalia Pavlova and Alexander Zaitsev in Moscow. Atakhanova/Spiridonov's international debut came in September 2015 at the 2015–16 Junior Grand Prix (JGP) competition in Linz, Austria. Ranked first in both segments, Atakhanova/Spiridonov won gold by a margin of 3.79 points over the Czech Republic's Anna Dušková / Martin Bidař. At their second JGP assignment, in Toruń, Poland, they were awarded the silver medal behind Ekaterina Borisova / Dmitry Sopot of Russia. These results qualified them for the 2015–16 JGP Final in Barcelona, Spain, where they won the bronze medal behind Borisova/Sopot and Dušková/Bidař. At the 2016 Russian Junior Championships Atakhanova/Spiridonov won the silver medal behind Anastasia Mishina / Vladislav Mirzoev and were selected to compete at the 2016 World Junior Championships in Debrecen, Hungary. They withdrew before the start of the competition due to an injury to Atakhanova. During the 2016–17 JGP series, Atakhanova/Spiridonov won silver in the Czech Republic and placed fourth in Estonia. Finishing fourth in the JGP rankings, they qualified to the JGP Final in Marseille, France, where they would place sixth. Ranked 8th in the short and first in the free, they finished fourth overall at the 2017 World Junior Championships in Taipei, Taiwan. They received a small gold medal for their free skate. Set the junior-level pairs' record for the short program to 64.79 points at the 2016–17 ISU Junior Grand Prix competition in Tallinn, Estonia.